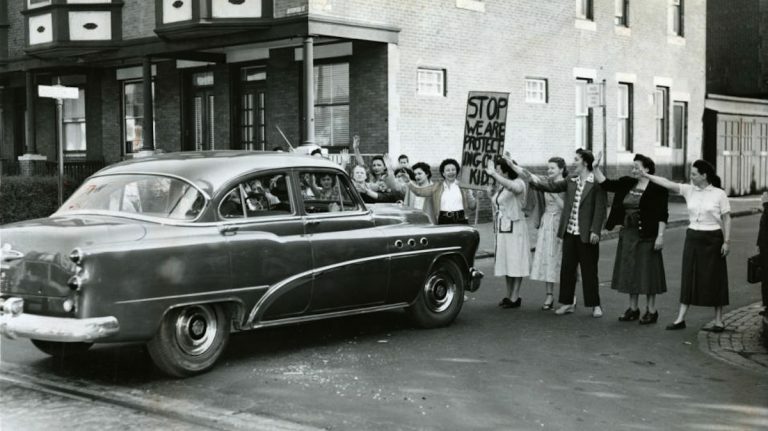 'Housewives and children demonstrate for stop sign' Philadelphia Evening Bulletin Photograph Collection. Courtesy of the Special Collections Research Center, Temple University Libraries. Philadelphia, PA, 19122. “What is old is new again” might just be the catch phrase that defines Philadelphia. The safe and livable streets movement has been taking strong roots over the past couple of years around the country and in recent months, has seen more momentum in Philadelphia after a report from The Bicycle Coalition of Greater Philadelphia. Groups like Kidical Mass Philadelphia (KMPHL) with parents and children at the lead have been taking it to the streets, community meetings and the internet since 2012 to promote safer streets for families on bikes and foot in Philadelphia. In October, KMPHL took their monthly ride to 22nd Street in support of a much-debated bike lane. A bike lane that when implemented would help biking families access a museum, a school and playground amongst other amenities. For parents in car or on foot it would create a slower traffic pattern causing less collisions and safer street crossings. But KMPHL is hardly the first parent-fronted grassroots organization to protest and call for safer Philadelphia streets. Philadelphia parents and children who protested for safer, people-focused streets all around the city date back to the 1950s. After the deaths of neighborhood children, moms took it to the streets and shut them down — even at times getting arrested. They called for the stop signs and stop lights we now take for granted. Families who protested for these changes were sick of seeing children injured or killed trying to cross the street. A collection of pictures from the Philadelphia Evening Bulletin Photograph Collection at Temple University shows how fiercely we can fight to protect our children from preventable tragedy. Now it is our time to think about what amenities we want in the next years that in 60 years will appear all but normal. For family bikers like myself that is streets with slow speed limits, lights with longer pedestrian crossings, separated bicycle lanes, and wider sidewalks that go to places families need to access to — grocery stores, daycares, schools, libraries, museums and more. 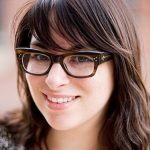 If you are curious about how safe livable streets work join KMPHL with the support of The Bicycle Coalition of Greater Philadelphia as they host a free Streetfilms viewing at Smith Memorial Playground on Saturday, Jan. 17 at 5 p.m.
Click here for more information about the Streetfilms viewing and to RSVP. Click here to view the full collection of photographs from Temple University’s Special Collections.